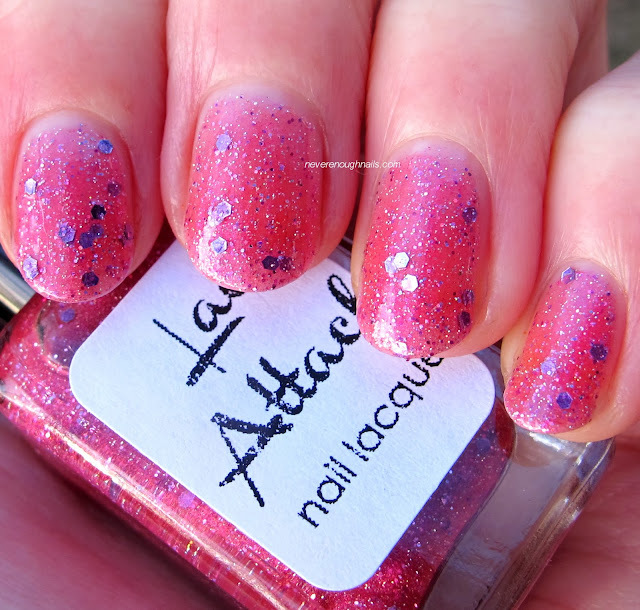 Lac Attack Amortentia is another beauty from the untrieds drawer. Being a giant Harry Potter nerd, I purchased the entire Magical Musings collection back when it first came out, but I've been slow to post them all. I'll get to them eventually! Amortentia is a pink shimmer base with teeny silver holo glitter and light purple holo hex glitter. This is four coats of Amortentia. Three coats was almost good enough, just not quite. Next time I probably would layer this over a pink base, but I wanted to see it alone. I really like it alone actually, it might be worth the four coats. Application was good, I didn't have any trouble getting the hex glitter out. The Magical Musings polishes are mostly out of stock on the Lac Attack site, but I know they will be re-stocked eventually. You can pre-order the whole Magical Musings collection here.